Frenchies are lovable, playful companions with personality for miles. However, they come with a unique language all of their own! For some new owners, a few of their sounds can be quite startling. Below, we’ll explore 14 of the most common French Bulldog noises and whether you should be worried or not when you hear them. While many dog breeds slurp and slobber while drinking, French Bulldogs make slurping noises even away from their water bowls. These sounds are normal, especially in Frenchies with very heavy or loose lips. Most will make a soft slurping sound when drinking, eating, or waiting for a treat. French Bulldogs are prone to snoring. Some only snore a little, while others do it every time they fall asleep. As long as your Frenchie is otherwise healthy, snoring is normal. If your Frenchie suddenly starts snoring a lot when they barely did before, it could be a sign of other health issues. You may hear snorts in the middle of playtime or after your Frenchie has been sniffing around a dusty corner. Occasional snorting is nothing to be concerned about; it’s just their way of clearing their airway of dust or irritants. Excessive snorting, however, can be a sign of narrow nostrils or weak nostril flaps that close prematurely. Snuffling often accompanies snorting, especially in brachycephalic breeds such as the French Bulldog. You may hear snuffling while your dog is playing, searching for toys or dropped treats, or after a walk with you. This is another perfectly normal Frenchie sound. One of the most startling sounds is the reverse sneeze. A reverse sneeze is comprised of several quick, involuntary inhalations through the nose, snorting, and gagging. Scary as it may sound, the reverse sneeze is usually harmless. Some common causes include overexcitement, allergens in the environment, and irritation of the nasal and sinus passages. All dogs pant to cool off. Unfortunately, Frenchies aren’t very efficient at self-regulating their temperature. If your French Bulldog is panting a lot, they may be overheated. Take steps to cool your pup, and if they still seem distressed, head to the vet. French Bulldogs pass a lot of audible gas that elicits lots of giggles, but it’s completely normal. Because of their short muzzles, French Bulldogs tend to gulp air while eating or drinking, and that air must come out sometime. If your dog’s gas seems to come with tummy upset, vomiting, or diarrhea, head to the vet. 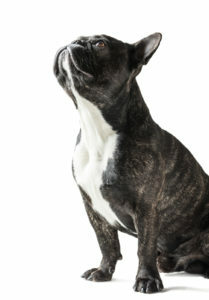 Occasional barking is one of your Frenchie’s many ways of communicating. A well-trained adult Frenchie who suddenly barks excessively might be trying to tell you something is wrong, though. Unusual barking can signal health issues or anxiety, so don’t ignore it. All dogs growl, but well-trained Frenchies usually only do it for playtime or to get your attention. If your French Bulldog is growling near their food bowl or a toy, it could be a sign of food aggression or guarding behavior and should be addressed immediately. Yelping and crying are usually signs of trouble. An especially talkative French Bulldog may use this type of vocalization to get your attention, but crying generally means something hurts or that your dog has been frightened. If you can’t find anything physically wrong with your Frenchie, check the environment for anything that could have hurt or scared them. As with crying, if your Frenchie is whimpering a lot, check your dog’s physical health and look for things in the environment that might be stressing them out. If everything seems fine, your Frenchie might just be telling you about their day. French Bulldogs will use a series of high-pitched whines to express their sadness, loneliness, or stress. They can be especially whiny after a stern scolding, so don’t let that fool you. If your dog hasn’t been scolded recently and is whining, look for physical issues or environmental factors such as too much heat or cold. Brachycephalic breeds tend to gag a lot due to gulping too much air with their water or meals and overexertion. A little gagging is normal for Frenchies, but excessive gagging and obvious signs of distress should be checked by a vet right away. Some Frenchies love to talk, and one of their signature sounds is the Frenchie wail. It can be mistaken for a cry of pain but doesn’t usually come with other signs of distress. French Bulldogs may wail after getting scolded or if they feel lonely, too. Most of the sounds your French Bulldog makes are normal. They’re a talkative breed known for using creative noises to express their wants and needs. Just be aware of your dog’s overall health, changes in their behavior, and anything in the environment that might be causing problems.